Content encompasses every living, breathing thing you’ll find on the web. If it moves, talks, or reads: it’s content. Clearly important then. So why, when it comes to the organisation, creation, and administration of content, can it feel as though the pillars of the web project team are working independently of one another? Get involved. Position yourself in the centre of it all and harness the collective expertise of your team to help create useful, usable, and enjoyable content. Go clear that fog of war. 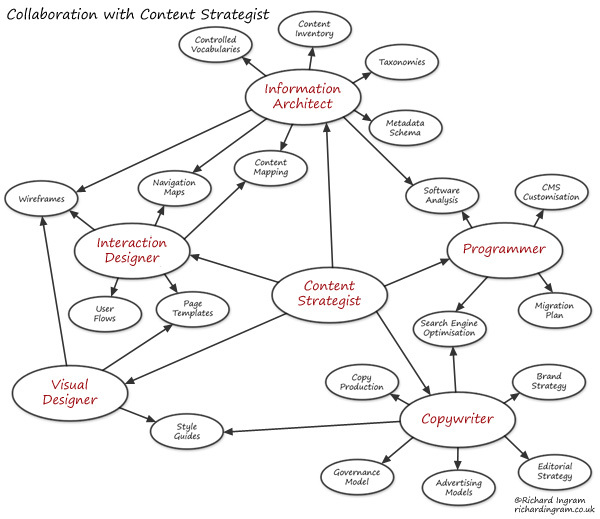 You might want to add in some concept map language that makes it clear that the Content Strategist works with these other roles on these deliverables. Don’t want people to think that we don’t produce anything! I take your point though. A larger scale version would have to incorporate many more of our roles and responsibilities within the team. Pingback: What’s All This Buzz on “Content Marketing”? « Snap! Pingback: My 2012 web design and marketing round-up of all things awesome.